'It's clear that this must have been a quite far-reaching and dramatic event that must have had profound effect on the society of the time,' explains Project Manager Mads Kähler Holst, professor of archaeology at Aarhus University. The remains will be exhumed from the excavation site over the coming days. Then an international team of researchers will attempt to discover who these warriors were and where they came from by performing detailed analyses of the remains. 'The dig has produced a large quantity of skeletal remains, and we believe that they will give us the answers to some of our questions about what kind of events led up to the army ending up here,' explains Dr Holst. The archaeological investigation of the site is nearing its conclusion for this year. But there are many indications that the find is much larger than the area archaeologists have excavated thus far. 'We've done small test digs at different places in the 40 hectare Alken Enge wetlands area, and new finds keep emerging,' says Field Director Ejvind Hertz of Scanderborg Museum, who is directing the dig. In fact, the find is so massive that researchers aren't counting on being able to excavate all of it. Instead, they will focus on recreating the general outlines of the events that took place at the site by performing smaller digs at different spots across the bog and reconstructing what the landscape might have looked like at the time of the birth of Christ. At the same time as the archaeological dig, geologists from the Department of Geoscience at AU have been investigating the development of the bog. 'The geological survey indicates that the archaeological finds were deposited in a lake at a point in time when there was a a smaller basin at the east end of Lake Mossø created by a tongue of land jutting into the lake,' explains Professor Bent Vad Odgaard, Aarhus University. This smaller basin became the Alken Enge bog of today. The geologists' analyses also indicate that the water level in the area has changed several times. Mapping these periods of high and low water levels chronologically using geological techniques will tell researchers what the precise conditions were on the site at the time of the mass sacrifice. The excavation is a cooperation between Skanderborg Museum, Moesgård Museum and Aarhus University. 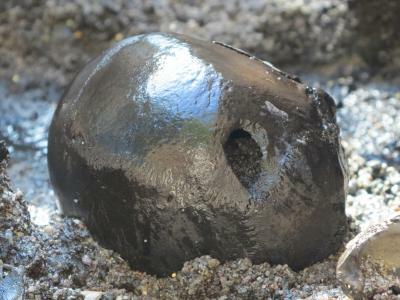 The project 'The army and post-war rituals in the Iron Age: warriors sacrificed in the bog in the Alken meadows in the Illerup river valley' is supported by a DKK 1.5m grant from the Carlsberg Foundation.